When people want the best work wear, they think Carhartt. The company has been known for decades as the leader in jackets, pants and other workwear. Perhaps it is because of this reputation for excellent jackets and pants that Carhartt boots have gone a little bit overlooked. But like the jackets and pants above them, Carhartt boots know how to work hard. Just like the people who wear them. Carhartt boots are loved by business owners, workers and even celebrities alike. There are many benefits Carhartt offers to business owners, or “corporate consumers,” if you will. Because Carhartt boots meet OSHA mandates, they are an excellent choice for business owners who need to make sure they are in compliance with all laws and regulations. Corporate consumers also like to buy Carhartt boots because of their ability to negotiate with unions, and for companies to subsidize their purchase. Brand awareness is a big benefit as well. When a business makes an investment in Carhartt boots, the employees recognize (brand awareness) that they’re getting a top-notch product, and they feel appreciated and valued. 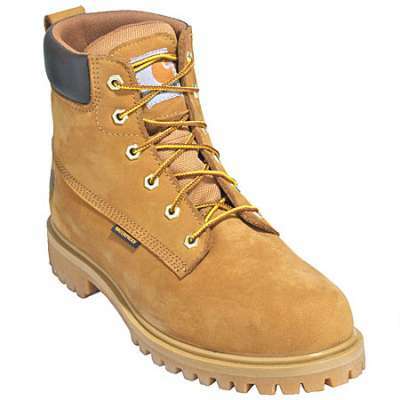 And the fact that there are many different styles of Carhartt boots means the right number can be purchased specifically for the functional needs of a specific job or working environment. And workers love to wear them too. Carhartt boots are lauded for their fit and comfort, as well as their durability. When it comes to boots, they need to fit right, feel good, and last a long time. So Carhartt boots have that going for them, which is nice. The price is also an excellent value — a great boot for a great price. Brand awareness is great as well. Because of Carhartt’s consistent demonstration of quality over the years, workers buy Carhartt boots because they trust that they’re getting something good. It’s a brand name they trust. And the functionality of Carhartt boots is another reason workers love them. For whatever they’re needed for, Carhartt comes through with a boot that is right for the job and work environment. Quality is paramount in Carhartt boots because it’s in Carhartt’s DNA. The DNA in Carhartt boots is made up of the work boot industry’s leading technologies, from Vibram soles to Ortholite footbeds to LiteFire insulation. Each component of Carhartt boots are specially designed with the wearer in mind, utilizing Achelles Flex Joints, Carhartt Heel Guards, Performance Comfort, triple needle stitched components, consistent fit, functional form that is built to perform, leather and linings, and to top it all off, waterproof. Carhartt boots are built with the best technology to create the best boots possible. They’re built to last, and built to perform. If you want boots that work as hard as you do, go to Workingperson.com and pick out your pair of Carhartt boots today.